Albanian authorities forced their way into a private zoo on Sunday and removed 12 animals because of fears that they were malnourished. TIRANA, Albania (AP) — Albanian authorities forced their way into a private zoo on Sunday and removed 12 animals because of fears that they were malnourished. Police and conservation officials pried open the main gate at the Safari Zoo Park in Mbrostar, 100 kilometers (60 miles) south of the capital, Tirana. The zoo had been closed by owners after criticism emerged about the treatment of its animals. 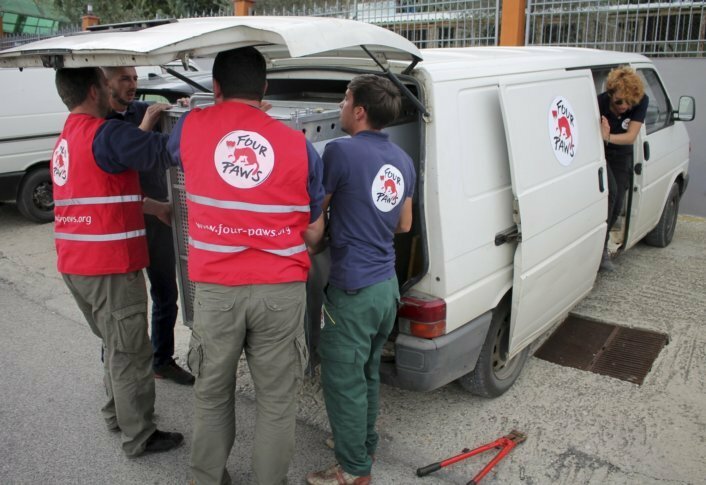 Veterinarians from Four Paws, an international animal welfare charity, sedated 12 animals — three lions, a bear, a waterbuck, four deer, a fox, a zebra and a turtle — and transported them to Tirana’s public zoo. They couldn’t find the turtle until late afternoon, according to Four Paws spokesman Martin Bauer. They will also work on solutions to take the remaining animals to other places, but only after the animals regain their health at Tirana zoo park, something which may take weeks. Albania’s environment and tourism ministry said it took the animals because their living quarters were too cramped and some were sick. Zoo owners have denied that the animals were sick or malnourished. Their lawyer, Elvis Sulejmani, said they had filled out all the necessary documentation for the animals, and complained that authorities illegally took possession of the animals without a court verdict.